Steeks are an excellent way to secure stitches before you cut open fabric that’s knitted in the round. After you steek a pullover sweater knitted in the round, you cut between the steeks to create a cardigan! Steeks are traditional on Nordic sweaters, but you can use them anywhere you want to cut open a line of knit stitches. Sewing in a steek: To make a steek with a sewing machine, sew two vertical lines of stitches an inch or so apart. 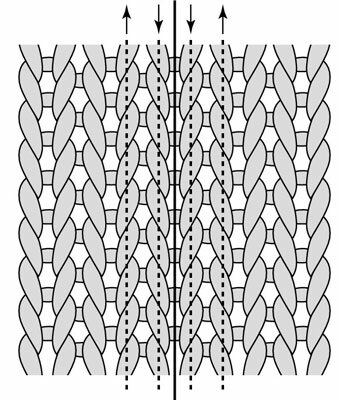 Keep the line of machine stitching between the same two columns of knit stitches all the way down. Use a sturdy cotton/poly blend thread and a stitch length appropriate to the knitted stitches (shorter for finer-gauge knits, slightly longer for chunkier knits). 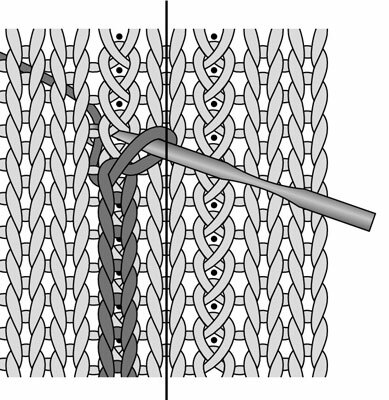 Crocheting a steek: To make a steek with yarn, crochet two vertical columns of stitches an inch or more apart using a slip stitch. Fold the sweater at the line you plan to stitch so the vertical column of stitches looks like the top of a crochet chain, then insert your hook into the first V, yarn over the hook, pull the new loop through the V, and move to the next stitch on your left, repeating while you go. Work only your crocheted stitches on the same column of knit stitches; if you veer to the left or right, your steek will be crooked. 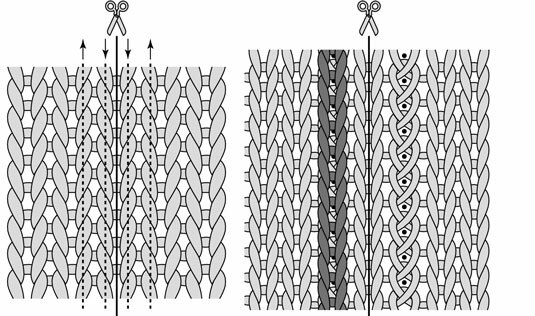 Cutting your fabric after you steek: After you sew or crochet the steek in place, it’s safe to cut your knitted fabric between the two lines of stitching. (Use sharp scissors for the cleanest cut.) Then, you can continue with your pattern as directed.